A robbery suspect escaped the Family Dollar on South Carrollton with an unknown amount of cash from the register, but not before the cashier trapped his hand and bit his arm, New Orleans police said. 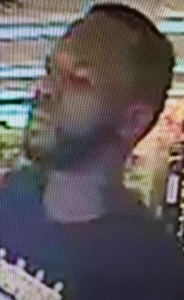 The man entered the Family Dollar at 3612 South Carrollton shortly before 2:30 p.m. Sunday, April 16, and asked the cashier for change for a dollar, but she said told him he had to wait until the register was already open, according to the NOPD report. After completing a transaction with another customer, the register drawer opened, and the man stuck his hand in to grab money, the report states. The incident is classified as a simple robbery because the suspect made off with an undetermined amount of cash, said NOPD spokesman Aaron Looney. Anyone who can help identify the bitten man is urged to call the NOPD Second District station at 658-6020 to speak to a detective, or CrimeStoppers at 822-1111 to leave an anonymous tip that could be eligible for a cash reward.